Rosacea is a chronic skin problem that makes your face turn red. It may also cause swelling and skin sores that look like acne. Rosacea involves swelling of the blood vessels just under the skin. It may be linked with other skin disorders (acne vulgaris, seborrhea) or eye disorders (blepharitis, keratitis). The condition is less common in men, but the symptoms tend to be more severe. Your health care provider can often diagnose rosacea by doing a physical exam and asking questions about your medical history. Your provider will help you identify the things that make your symptoms worse. These are called triggers. Triggers vary from person to person. Avoiding your triggers may help you prevent or reduce flare-ups. Other triggers may include wind, hot baths, cold weather, specific skin products, exercise, or other factors. Antibiotics taken by mouth or applied to the skin may control acne-like skin problems. Ask your provider. Isotretinoin is a strong drug that your provider might consider. It is used in people who have severe rosacea that hasn't improved after treatment with other medicines. In very bad cases, laser surgery may help reduce the redness. Surgery to remove some swollen nose tissue may also improve your appearance. Rosacea is a harmless condition, but it may cause you to be self-conscious or embarrassed. It cannot be cured, but may be controlled with treatment. Habif TP. 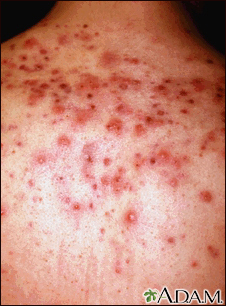 Acne, rosacea, and related disorders. In: Habif TP, ed. Clinical Dermatology. 6th ed. St Louis, MO: Elsevier Saunders; 2016:chap 7. Korman NJ. Macular, papular, vesiculobullous, and pustular diseases. In: Goldman L, Schafer AI, eds. Goldman-Cecil Medicine. 25th ed. Philadelphia, PA: Elsevier Saunders; 2016:chap 439.
van Zuuren EJ, Fedorowicz Z, Carter B, van der Linden MMD, Charland L. Interventions for rosacea. Cochrane Database Syst Rev. 2015;(4):CD003262. PMID: 25919144 www.ncbi.nlm.nih.gov/pubmed/25919144. 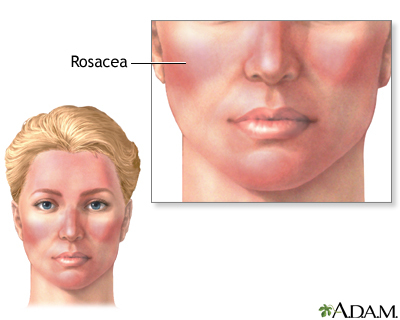 Rosacea is a condition where the area of the cheeks, nose, chin, forehead, or eyelids become inflamed. It is a chronic skin disorder that can cause redness, prominent blood vessels, swelling, or skin eruptions similar to acne. 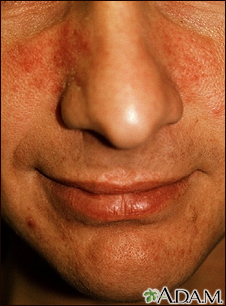 Rosacea occurs most often in fair skinned people, particularly those who blush easily. It is also more common in women. Rosacea has multiple phases, beginning with flushing of the skin, followed by redness, followed by the development of small blood vessels visible in the skin. The later stage and is exhibited by the red blisters on this person's cheeks, nose, forehead, and chin. Underlying redness and small blood vessels are also seen.